Back in 2013, Star Wars was in a rough place. The most recent movie had been 2005’s Revenge of the Sith, while the newest video game had been 2012’s Kinect Star Wars. Both got plenty of attention, but little of it was good. So when Disney bought Lucasfilm in April 2013 and then gave EA the keys to the Millenium Falcon in May, fans hoped this might lead to a Star Wars video game resurgence. Nearly six years later, that resurgence has not happened. While Disney’s new Star Wars movies (and cartoons) are generally great, the video game landscape remains grim. Gibeau is no longer at EA, having left for Zynga in early 2016, and the publisher has only been able to release two console games since 2013: the well-received but multiplayer-only Star Wars Battlefront and its catastrophic sequel, Star Wars Battlefront II, which epitomized the worst habits of modern gaming with its to pay-to-win mechanics, discovered as the game was in beta. Those mechanics proved so controversial that EA stripped them from the game before it even came out. What became of EA’s other ambitious Star Wars plans? In October 2017, the publisher shut down Visceral Games, the studio behind Dead Space, and cancelled its turbulent project Ragtag. The legendary role-playing game developer BioWare has tried to get a Knights of the Old Republic sequel off the ground for years but has never quite succeeded. And this month, as I broke last night, EA canceled yet another Star Wars project code-named Orca, which had been in development at its Vancouver studio since Visceral’s closure. There are projects still in the pipeline, including Jedi Fallen Order, an action-adventure game from the makers of Titanfall that’s currently scheduled for a fall 2019 release. EA Vancouver is now making a smaller-scale Star Wars game in hopes of releasing it around late 2020 (to coincide with next-gen consoles), and, according to people connected to the company, EA’s Motive studio in Montreal is also leading its own smaller-scale Star Wars project that has not yet been announced. There’s also the long-running massively multiplayer game Star Wars: The Old Republic, which still receives updates, as well as a few mobile games, like the popular Star Wars: Galaxy of Heroes. But it’s safe to say that fans were hoping for more than this. In six years of EA’s stewardship over Star Wars, we’ve seen two significant console games, both of them Battlefronts. This is the most popular franchise on the planet, one that’s full of lore, depth, and rich characters to explore. How did EA screw up so badly? 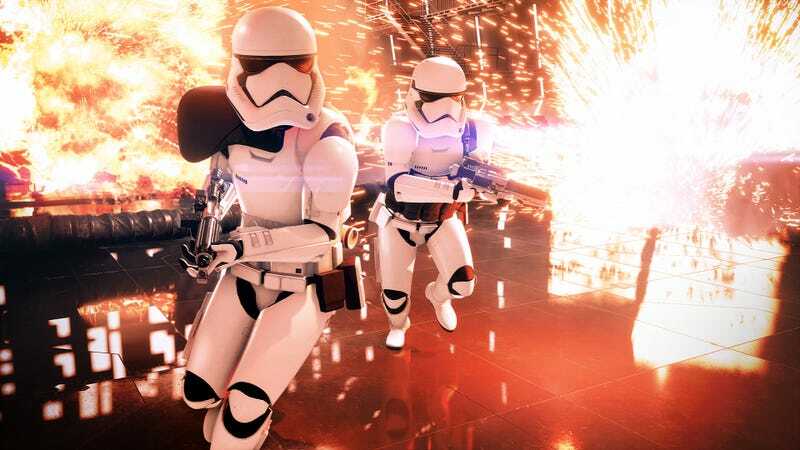 There are many answers to that question, including “Star Wars games are tough to make” and “Big publishers are full of bureaucracy.” It’s impossible to point to a single factor for Star Wars’ recent video game drought. Here’s an interesting tidbit I keep hearing, though: The scuttlebutt among those who work or have worked at EA is that CEO Andrew Wilson was never entirely thrilled with the Star Wars deal. It was made by his predecessors, after all. When I asked, an EA spokesperson denied that Wilson was unhappy with the deal, calling it “pure speculation and not accurate.” Proving how someone feels will always be impossible, but this is something I’ve heard from a number of people in various positions at EA, including high ones. Wilson, who took over in September 2013, has always been public about the value of EA making its own intellectual property. Aside from the publisher’s lucrative sports division, which brings in roughly a kajillion dollars a year thanks to FIFA, the Wilson era of EA has largely focused on franchises that the publisher owns, including Titanfall, Battlefield, and the soon-to-be-released Anthem. Under Wilson’s leadership, EA also doubled down a single game engine, Frostbite, which it would use for almost all of its games, whether or not they made for a good fit. The logic behind this decision was simple: EA owns Frostbite. When it uses Frostbite, EA doesn’t have to pay licensing fees or deal with technical support at a competing engine-maker like Epic. Frostbite is also extraordinarily difficult to use on open-world games like the one that EA just canceled, according to several people who have worked with it, but the publisher believes that the benefits outweigh those detriments. Compare the Wilson era to previous iterations of EA and you can see this difference. In the past, the publisher has worked with licenses like Harry Potter, The Godfather, James Bond, Warhammer, The Simpsons, and many more. But since Wilson took over in 2013, EA has stuck primarily to Star Wars, sports, and its own franchises (with only a couple of exceptions on mobile). Wilson’s appetite for original properties could be incompatible with a franchise like Star Wars, which is owned and operated by Disney and its subsidiary, Lucasfilm. Working on a Star Wars game requires constant conversations with Lucasfilm. It means navigating bureaucracy, sorting through a complicated approval process, and realizing that your game is always going to play second fiddle to the movies, TV shows, and everything else that Lucasfilm has in the works. It also means that whatever EA makes, Mickey Mouse will share in the profits. While EA is a publicly traded company, it does not offer specific sales figures, so there’s no way to know exactly how each of its console and mobile games have performed. And there’s no way to know how much of a cut Disney takes. It’s impossible for an outside observer to say how good the Star Wars deal actually is for EA, just as it’s impossible to say whether it would have been financially wise for EA to have made twice as many Star Wars game as it’s actually released. It’s not clear what will happen with Star Wars in the coming years. I don’t know the specifics of Disney’s deal with EA, or whether it has any out clauses, or whether there are conversations on either side about bringing it to an end. For years now, fans have expressed desire for the exclusivity deal to go away. Maybe it should have never been made in the first place.